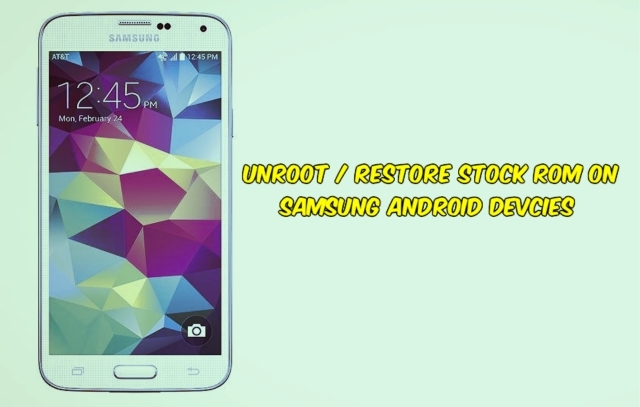 If you have the Rooted Samsung device or running the custom on your phone and want to unroot/restore stock rom on your device. Here is the easy guide to go back on stock rom. Rooting has lots of benefits which you can enjoy on your device, you can enjoy custom roms and other tweaks, but this will void the warranty of your device. To get back the warranty on your Samsung device you have to come back on the stock rom. Today, I will guide you, using the step by step tutorial, how to UnRoot Samsung devices and restore the official firmware. 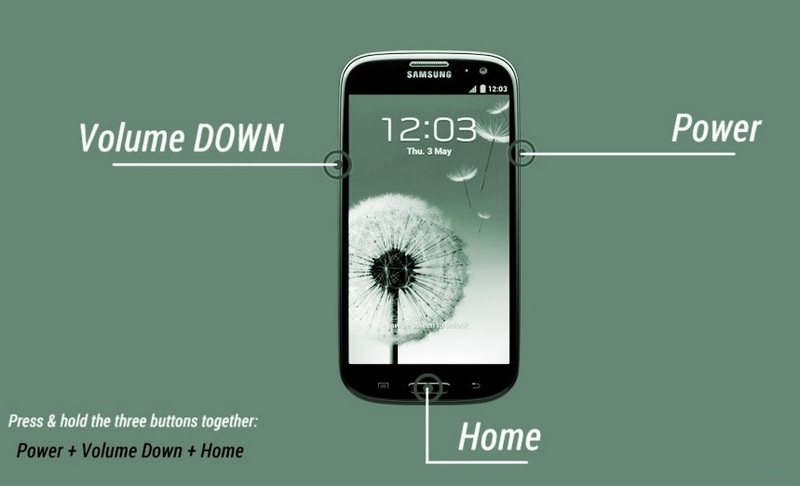 This guide will work on all the Samsung Android device and easy to use. All you need a official firmware package, ODIN flash tool and triangle away android application to reset flash counter. Flashing back the stock ROM also helps you resolve any issues that you might be facing with your current ROM. Lets take a look how to do that in simple steps. a) Do take the full backup of your device. Read some of the best android backup guide here :- How to Backup SMS, Contacts, Settings & Apps in Android phone and Create Full Backup of Your Android Device on Cloud. b) Install the Samsung USB drivers on your windows PC here. c) Also Enable USB Debugging on your Samsung device. d) Make sure that your Android battery is full charge or near about 50-70% battery level. a) To go back on the stock rom or unroot you need a official firmware for your device. 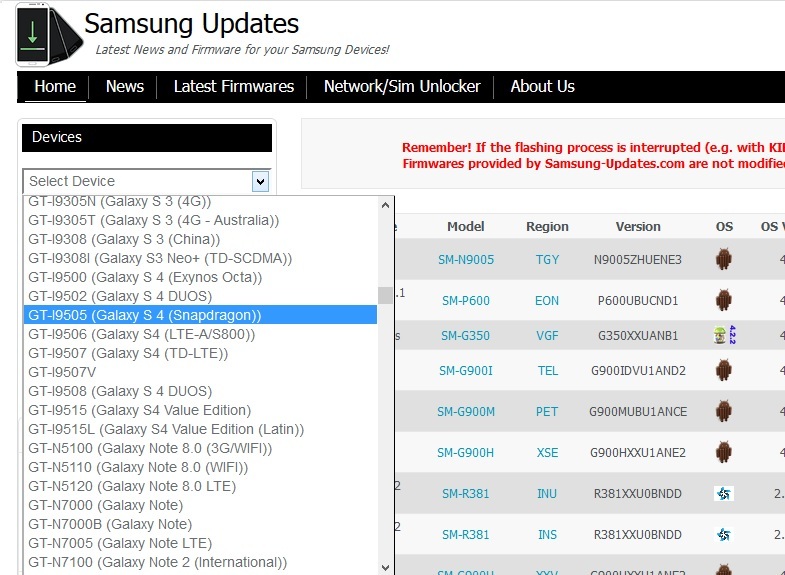 Just head over to the Samsung Updates website, use the dropdown menu to select your device and download the firmware on your desktop. And Extract the firmware folder on your desktop. b) Download the ODIN flash tool here and extract the folder on your desktop. In the Folder you will see the ODIN.exe file, you need this application to flash the rooting package. Step 1. Turn off your Samsung phone or tablet and boot it into the Download Mode. To do this press and hold the Volume Down key, Home button, and Power button. You should see a warning triangle sign, press Volume Up to continue. Step 3. Now connect your phone to the Windows PC with the help of USB cable. At this point make sure Odin recognizes your device. The ID:COM will either turn blue or yellow and you’ll also see Added!! in the message section of odin. Step 4. Now select the firmware file that you downloaded from the above. You can get all these files on the Firmware package that you’re downloaded above. Also note that only Auto Reboot and F. Reset Time should be checked and leave the rest. Step 5. Now click the Start button at the bottom of the ODIN tool. It will then start flashing the Stock ROM on your device. This will take some time, once the installation is done you will see the “PASS” message with green background on the ODIN application. Step 6. After the installation is completed, your phone will restart and at this time you can disconnect your device from the PC. That’s it! Now you phone is running on stock rom and unrooted. To rest the Flash counter of your device install the Triangle away app from Google play store and run it once.